Full Circle Insights released two new solutions to its marketing management platform on Wednesday to help enterprises evaluate their data and ensure consistency between sales and marketing departments, which are now available on its platform, Full Circle Response Management. Full Circle Quick Dash is a set of analytic dashboards, while The Full Circle Method is an educational framework for how marketers should be evaluating their data. Marketing and sales must be able to collaborate and work as a team in the B2B world, particularly since marketers will generally pass off a lead to a sales representative in order to close a deal. A lack of communication during this handoff process -- or a lack of unified data -- can cause customer service disruptions that harm the sales process. Full Circle Insights is a lifecycle management solution that helps make this marketing-to-sales transition easier for enterprise companies using Salesforce as their CRM system of choice, providing visibility for the entire marketing funnel. 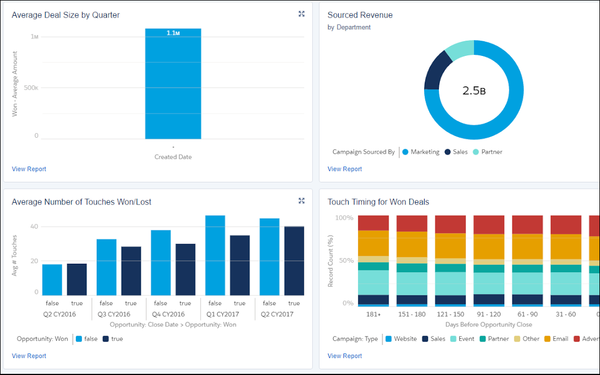 Built natively on Salesforce, Full Circle Insights helps B2B marketers unify their data sources and make sense of the numbers. Bonnie Crater, CEO of Full Circle Insights, says the platform mitigates three key challenges facing B2B marketers. It helps keep data consistent between sales and marketing, it tracks the full funnel as opposed to just the top or bottom, and can accommodate both account-based marketing and response-based marketing. Email service providers, like MailChimp and Campaign Monitor, provide first-time email marketers with templates they can use as a guideline while curating their email messages. Full Circle Insights has now applied a similar approach to analytics with Full Circle Quick Dash. Quick Dash pre-packages four analytic dashboards that highlight marketing measurement insights. The pre-built dashboards act like a template for how marketers should be looking at their data, focusing in on four key areas: planning, achieving, optimizing and evaluating marketing performance. Similar to email templates, marketers can use Full Circle Insights Dashboard as a baseline for developing their own customized templates. Crater says the dashboards are “100% customizable” and that marketers have tons of flexibility to take the dashboard into any direction they want. Since it is natively built on Salesforce, marketers can also drill down into the data by clicking on the interactive chart to see all the underlying, supporting data points underneath. Because data is not siloed between a CRM system and marketing automation platform, data between marketing and sales teams is consistent. The visibility of the entire customer journey “makes the transition from marketing to sales as easy as possible for leads, and it’s a whole lot easier than having two systems,” says Crater.